Would you believe it has been close to 40 years since I took part in parking lot racing and I thought I had it out of my system but the more I research this thing called Nitro RC Racing...The track was open early on Friday so by noon the parking lot adjacent to the track was filled with tents, motor homes and driver pit tables everywhere. A scene right out of Riverside Raceway east of Los Angeles, but in reality it is the ProLine Maxx Challenge last June near Banning, CA, just outside of Palm Springs. The description, "The Pro-Line Nitro Maxx Challenge was an awesome racing spectacle. The action during the qualifiers and mains was intense in all of the racing classes and the track was as big and challenging as they come. 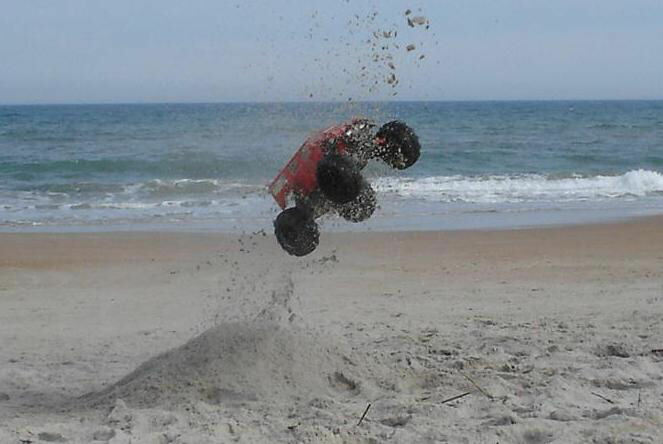 The facility was filled with friendly people who all share the same passion for RC racing and the weather was nearly perfect; yup a good time was had by all." by the editor of "Radio Control Car Action" the leading magazine of this intense hobby. This was my intro to nitro racing. The nitro gas runs about 25 cents a gallon. Methanol is its main ingredient, and provides most of the power. Nitro is added to assist the idle and acceleration, as well as increase power. The oil that's in the fuel is the source of lubricant for the engine. Methanol is used for two main reasons: 1) It can be ignited with a platinum-element glow plug, and 2) It releases more energy per pound of air than gasoline. It's also very easy to obtain, and is inexpensive. 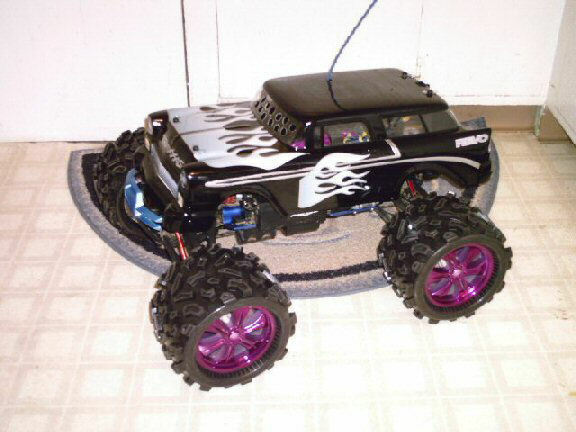 One of the amazing things you will find when you start to explore Nitros is the intense amount of interest these radio-controlled models are getting worldwide. For instance, the Internet Forum run by the editors of Radio Control Car Action draws over 30,000 posters and when I visited, over 7,500 were also visiting at the same time. 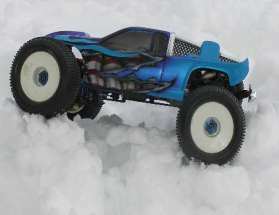 Most hobby forums are in the range of 500 online and 15,000 posts. To reach speeds in excess of 200 mph, these racers run on circular tether lines. The engines burn a mixture of eighty percent methanol with twenty percent castor oil, and all the cars are very narrow bullet shaped vehicles no wider than the mounting lugs of their engines. These races draw contenders from all over the world. G.A. 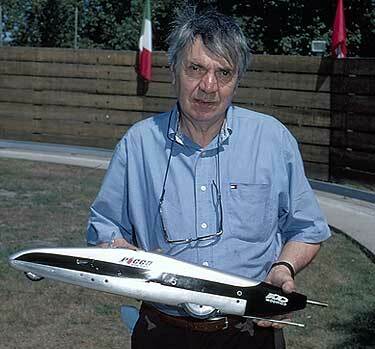 Picco (left) reached a speed of 201.4mph with his Nitro model. This particular event was held in Wantagh, (Long Island) NY. There are three tether car race tracks in America. In addition to Wantagh, there is a track in Anderson, Indiana, and another in Whittier Narrows, California. Across the big pond, there are 20 tracks divided between Italy, France, Germany, England and Sweden. Every two years, international race meets are held at the track in Wantagh, N.Y. These contests attract racers from all of the above countries. World wide, there are about three hundred tether car racers still trying to push the speeds up. I'm going to try to get to Long Island for the next races. They are held every two years and this year promises to see the 205 mph Wantagh record beaten again.